The couples, through their Ullmann/Pegg Group, are preparing to lease 3,000 square feet in the new development. They’re targeting a first quarter 2019 opening. Ullmann/Pegg Group is investing about $300,000 of its own capital into Virginia Axe Co., with plans to open two additional facilities in the state by 2020. 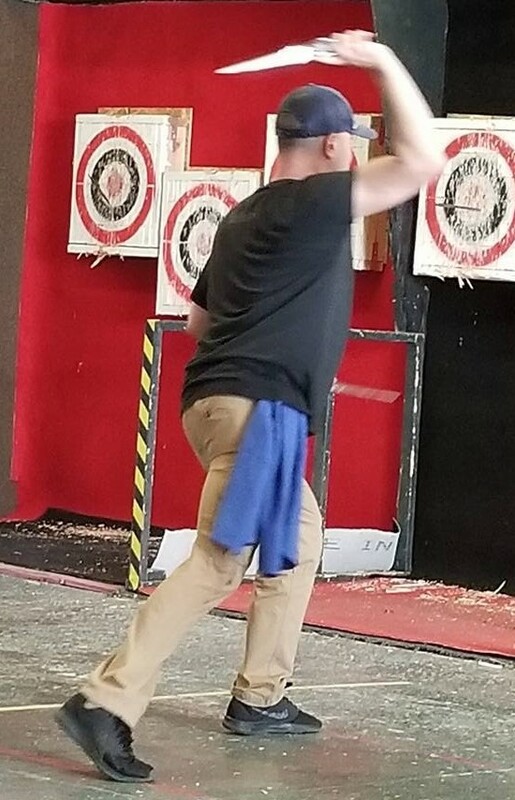 Looking to build on the national trend of axe-throwing venues, which have popped up in many larger cities, Virginia Axe Co. will have up to six lanes for traditional, tomahawk and hatchet axe throwing. It also will offer traditional and no-spin knife throwing. Each lane will be equipped with an “axepert,” who Pegg said will be trained to show patrons how to throw the axes and knives that will be provided. Virginia Axe Co. plans to charge $25 per person for 1½ hours of axe or knife throwing, Pegg said, for a minimum of four people per lane. He said the price includes about 30 minutes of coaching prior to an hour of competition. Looking to appeal to workers punching the clock after 5 p.m., Pegg said Virginia Axe Co. will open from 5 to 10 p.m. Thursday and Friday, from noon to 8 p.m. on Saturday and from noon to 5 p.m. on Sunday. The business also plans to offer special pricing for groups, parties and corporate team building events. Leagues will be encouraged once the facility hits its stride, Pegg said, with the goal of creating a professional ax and knife team to represent the Richmond region in U.S. competitions. The venue also will host tournaments and onsite training for those looking to enter professional axe and knife competitions. Pegg said the location will serve light food and drinks, but no alcoholic beverages. Prior to choosing Rockville, Pegg said he and his wife explored several locations in Scott’s Addition and Short Pump. But they liked Rockville because of its limited entertainment options and proximity to Short Pump, and the nearby population of residents with expendable income. James Clark Jr. of Statewide Commercial represented the Ullmann/Pegg Group in its lease. Goochland County approved Rock Center, a 21,000-square-foot office and warehouse complex, for construction. Colliers International | Richmond brokers Eric Williford and Andrew Ferguson are preleasing the site. Midlothian-based Superior Contracting Co. is developing the 2-acre project after purchasing the site from Lucky Stone about 11 years ago for $364,000, according to county records. Pegg said the group looks to increase its Rockville facility’s offerings by providing bow and arrow, and slingshot targets. Also planned is forming a mobile ax and knife throwing unit that can travel to corporate events or festivals (different from the professional team). Launching The Virginia Axe Co. has been a labor of love for Pegg, who only four years ago began getting involved in competitive ax and knife throwing. The others will keep their day jobs as well. Greg Ullmann is a corporate accountant with a medical device company and Kathy Ullmann is a national sales manager. Tamera Pegg is a retired elementary school teacher. Pegg said while they are looking to hire a full-time onsite manager to oversee operations, the team will be at the location regularly to check on things. 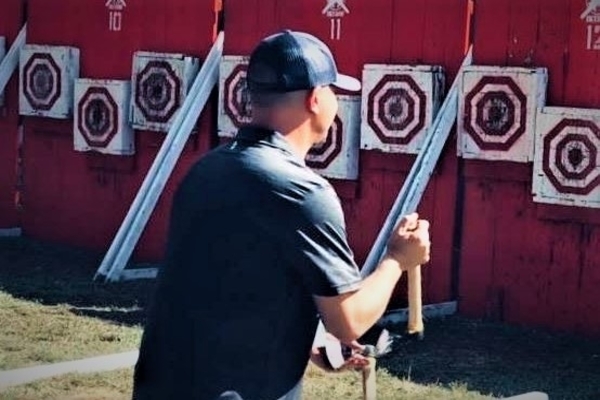 Pegg has racked up several awards for his ax and knife throwing skills, including second place in the ax division in the 2017 Central U.S. Championship in Austin, where he’s returning in October to defend his title. The axe-throwing trend has arrived elsewhere in the local market. G-Force Karts, a indoor go-cart racing track, recently opened three axe-throwing lanes in its facility in eastern Henrico. 1 Comment on "Goochland getting in on axe-throwing trend"
This sounds like a fabulous idea! It sounds like Dan Pegg and the Ullman/Pegg Group are really on to something here. I look forward to bringing my Boy Scout troop here for some friendly competition. Best of lusk to the Pegg’s and Ullman’s!! !